This 5CD/3LP/1DVD set is no laughing matter. It may actually cause you to either A) overdose on the Thin White Duke, or B) cause serious anxiety over the enormity of this thing. I have to admit, after going through its contents there was a lot to take in. What you get inside this impressive behemoth of awesomeness is: the ‘Station to Station’ CD from the original analogue masters, the 1985 RCA CD master, previously unreleased 1976 concert from Nassau Coliseum NY on CD, the Singles CD EP, new Harry Maslin DTS 96/24 and Dolby Digital 5.1 Surround sound mix and stereo mix on DVD, 180g audiophile vinyl of original analogue master, 180g audiophile vinyl of the 1976 Nassau Coliseum Concert, replica back stage passes, replica biography, individually numbered replica ticket, replica band line-up, three press photos, replica fan club folder, replica fan club membership card, replica fan club certificate, two collector’s cards, photos, buttons and poster. This is quite a collection devoted to an album that originally only featured six songs, but six songs that were seen as ground breaking and ushering in a ‘new’ era of Bowie. 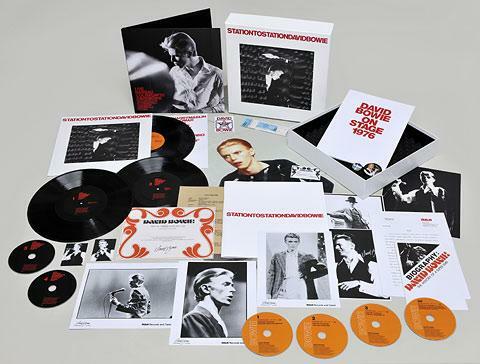 “Station to Station” served as the first Bowie album I ever purchased, so needless to say, I geeked out over the release of this uber-deluxe beauty. What I love most is the unreleased Nassau Coliseum show on both 180g vinyl and CD for my listening pleasure at home and on the go. Thanks to Bowie and the producers for thinking ahead on this one, as vinyl sales and popularity seem to be going through the roof these days. The live Nassau show was the first thing I listened to upon tearing open the box. This entry was posted on Friday, November 12th, 2010 at 12:20 pm	and is filed under Music. You can follow any responses to this entry through the RSS 2.0 feed. You can skip to the end and leave a response. Pinging is currently not allowed. Damn I cannot wait to go through all of this material and music. David Bowie is a genius sent from outer space to rock the party! I don’t own a record player because I’m neither a Hipster nor an old timer. Luckily for people like me there is a 3 CD version that also includes the live concert. It’s on my Amazon wishlist and would make a tremendous present for the holidays!!! It’s all good, CrescentFresh 22. You don’t need to be a hipster or old timer to own vinyl. The music just sounds better on wax, but it is nice to have the portability and convenience of digital music. Sadly, some of the best music out there has not, nor will ever make it on to CD, so who knows what you’re missing out on! Used records are pretty cheap these days, as is a good quality portable record player. Now is the time to embrace the vinyl! « Take a look at the Trailer for “Battle: Los Angeles”! !